Sometimes, the built-in speaker on your smartphone just isn’t enough. The audio quality might be subpar or the volume is just lacking. If you want to listen to better audio, then you might need a dedicated smartphone speaker for the job. 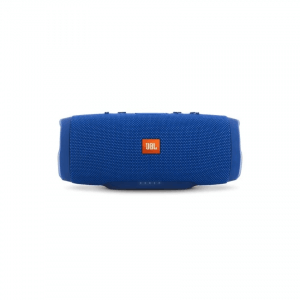 Bluetooth speaker manufacturers like JBL and Harman Kardon have already released many outstanding products making it difficult to choose. In this article, we’re going to introduce some points to consider when choosing a smartphone speaker and recommend some of the best speakers for smartphones that you can buy on the market. First, let’s learn a bit more about the smartphone speaker. There are two major classifications for this device: wired and wireless. Wireless speakers let users take advantage of technologies like Bluetooth, NFC, and Wi-Fi to pair your smartphone with the audio device. 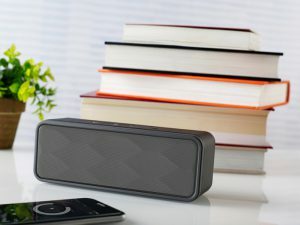 Wired speakers, on the other hand, do not support the above-mentioned specs, which means they require your smartphone to be connected to the speaker at all times. Most modern wireless speakers can function even when the smartphone is 10 meters away. Any farther than that and you’ll experience lags or interferences with the audio quality. Nonetheless, many wireless speakers have built-in batteries so you can bring them around your house or wherever you desire for convenience. However, a wired connection is known to have a more stable connection than wireless connectivity. However, the downside is that users won’t be able to freely move around with their smartphone. If you want to be free from any wires or cords, then opting for a wireless smartphone speaker would be best. In this segment, we’ll introduce six factors to consider when selecting a speaker for your smartphone. There are some technical jargons included, but don’t worry, as we’ll be tackling them as you go through the article. Whenever your smartphone is sending audio data to a wireless speaker, it’ll compress the audio information while transmitting it to the device. The codec is the standard of compression taking place during the time of transfer. There are 4 types of codecs, and these are the following (by order of sound quality): LDAC, apt-X, AAC, and SBC. LDAC – This codec is a standard developed by SONY back in the year 2015. The system behind the codec refers to a high-resolution sound source. Therefore, users can enjoy the highest audio quality possible from their smartphones. However, since the codec is from the tech giant, it’s only compatible with a Sony smartphone. apt-X – CSR company developed this codec. The sound quality with this codec at play emits an audio quality very close to playing a CD. However, there are some compatibility issues so not every mobile phone and speaker supports it. AAC – This codec standard is highly familiar to anyone managing their music through iTunes. The audio quality while using this codec standard is reasonably good. SBC – It’s dubbed as the “Standard of Standards.” All smartphone and speaker models are compatible with this codec. However, the compression ratio is quite high. Hence, the sound quality isn’t as good as compared to when you’re using AAC or apt-X. Always ensure that your smartphone and speaker are compatible with each other. In other words, if you purchase a speaker that can only accept the apt-X codec, and you have a Sony Xperia smartphone, then the speaker will be nothing more than an expensive paperweight. Even though the audio quality will heavily depend on the codec, it’s not a necessity to be particular about it. Of course, it’s still better to choose a high-quality codec, especially if you truly value sound quality. However, if the speaker’s internal components aren’t of a reasonable quality, then all might be for naught. Hence, it’s better to check for specs first before you start nitpicking over the codec. Compatibility should be your number one priority above anything else. Of course, if you’re a proud owner of a Sony smartphone, then you can listen to high-quality audio files if you choose a compatible speaker. Aside from the codec, you should also look into the number found on the speaker’s built-in amplifier. The bigger the output value, the better the maximum volume. Furthermore, the sound quality is also affected by the device’s speaker output. Simply put, if the maximum volume of the speaker can go high, then the main power found in the unit’s amplifier is equally large. 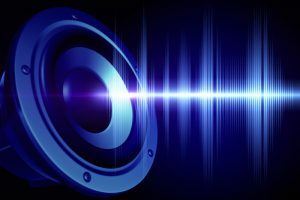 Therefore, if you’re looking for a smartphone speaker that can produce audio loud enough for a large room, then you should look for a device with a large amplifier. Speakers that go beyond 10W can have considerable audio output properties. However, you can enjoy a decent level of quality even if you have a wireless speaker dishing out audio at 3W. A good speaker can still serve its purpose with or without a waterproof feature. But if you plan on using the speaker in an environment where it might get wet, then you should consider a waterproof speaker. For example, if you’re going to use the speaker inside the bathroom, at the pool, or by the beach then a waterproof unit is advised. 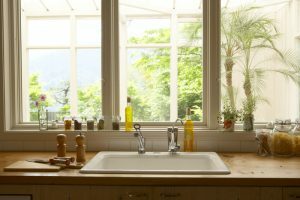 However, if the speaker will most likely stay near completely dry areas, then it won’t be necessary. 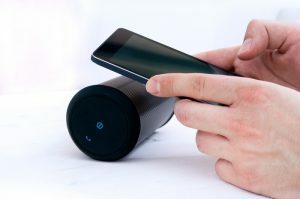 One of the easiest and most common ways to connect a smartphone with a wireless speaker is through Bluetooth. However, if both the speaker and your mobile phone have NFC technology, then pairing becomes easier as compared to sticking to just Bluetooth. A light touch for both devices is enough to pair them if they both have NFC. There are also some smartphone speakers that can pair multiple devices together at any given time. Therefore, each person in the group can enjoy listening to their favorite tracks and media files without having to unpair one device first. 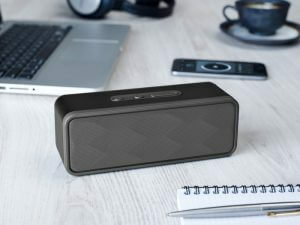 Most wireless speakers now come is a compact form. They have internal batteries to allow you to bring them practically anywhere you want to go. In this regard, you have to think about the battery life of the smartphone speaker. If the device will stay at home most of the time, then a short battery life might not be too much of an issue. Smartphone speaker manufacturers often offer about 10 hours of battery life for their products. However, there are some models that do offer more battery life than others. Keep in mind that some speakers have their amplifiers suppressed just to eke out more battery life for users. Hence, if you value excellent audio quality, then you might have to sacrifice battery life while you’re at it. There’s a broad range of speaker sizes and weights found on the market. Always check these factors before you purchase the device to prevent image deviation. 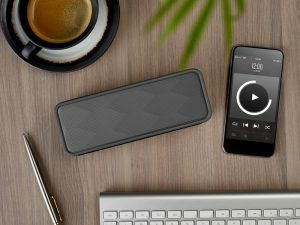 In other words, if you check the product description, you won’t have to regret your purchase if you initially thought that the speaker is going to be larger or smaller. In this segment, we’re going to show you our top picks for the best smartphone speakers that you can buy from today’s market. The Amazon Echo 2017 version is the less expensive update to its predecessor with the same name. 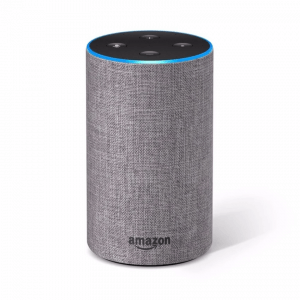 Users can also take advantage of all the offerings of Alexa, and it has a loud volume to boot. However, this device leans more to being a personal assistant than a dedicated speaker. Its audio quality could be better. However, you do get what you pay for with the reasonable figure in its price tag. 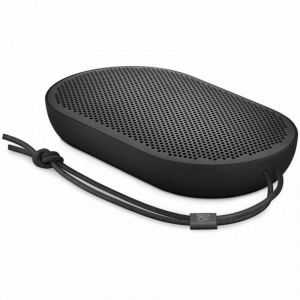 If you want more bang for your buck, then you ought to consider the Beoplay A1 from Bang & Olufsen. It’s beautifully designed and it comes with a leather strap. It comes with a hefty price tag, but rest assured as you can expect superb sound quality. 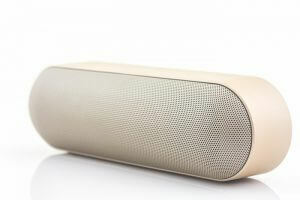 This speaker connects through Bluetooth, but sadly, it does not support Wi-Fi connectivity. Its battery supports USB-C fast charging and can last up to two days. One caveat is that it’s not waterproof, so be careful not to get it wet. 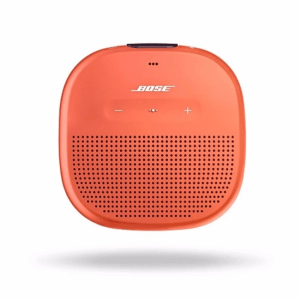 This wireless speaker is designed to fit into any home or office, which is why it comes in classy colors. It takes 3 hours to charge this device, and it should last you around 10 hours of continuous music. 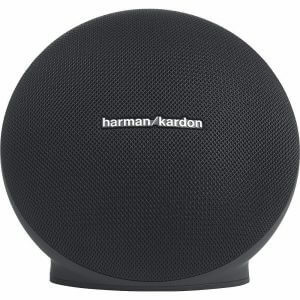 Bass lovers will get a kick out of the Onyx Mini by Harman Kardon. It presents a thick richness in its bass performance. It even has an excellent clarity found in the highs. However, it’s quite expensive for what little features it can offer. If you don’t want to spend a ton of your hard-earned cash on a smartphone speaker, then consider the SoundLink Micro from Bose. This speaker is one of the better-sounding units you can find on the market. Its excellent audio quality does come as a surprise considering its compact construction. However, it does share the same problem as with the Harman Kardon Onyx Mini. In other words, it’s a bit on the expensive side considering it’s not offering a lot of features in return. 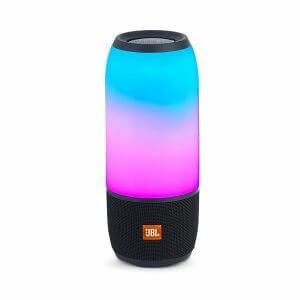 Interested buyers with tight budgets should rejoice at the sight of the Clip 2 by JBL. This compact powerhouse can deliver loud volumes. Furthermore, it has a waterproof construction. Therefore, you can bring it with you to the swimming pool if you desire. For some reason, JBL didn’t include a button to return to the previous track. The only track navigation button you can find on this device only allows you to proceed to the next track in the playlist. 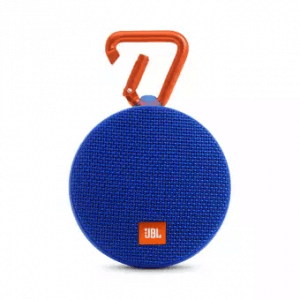 The Pulse 3 from JBL delivers great power in its low-end sound signatures. Bass lovers can enjoy the deep audio delivered by the unit. Individuals who want more than just a boring speaker can enjoy the lights produced by this device. This speaker is waterproof and can survive being submerged in water for up to 1 meter in depth. It also has a built-in microphone and 360-degree sound. One downside is that it doesn’t have a long battery life. 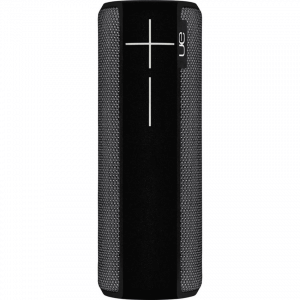 If you’re looking for a smartphone speaker that you can bring to the swimming pool, beach, or your bathroom, then consider the Charge 3 by JBL. This speaker for smartphones has a waterproof construction. It also has an above average battery life compared to other similar devices. You can also use this to your advantage by charging your phone–in case you forget to bring your power bank. 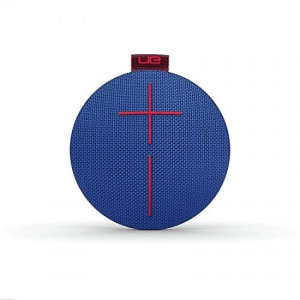 The Boom 2 by Ultimate Ears presents itself as an upgrade to its predecessor with the same name. It still has a brilliant design with slightly better sound quality. While most speakers for smartphones sport a rectangular or cylindrical design, the Roll 2 by Ultimate Ears doesn’t follow that trend. Instead, it looks like a protruding pancake. Its unique looks also come with a waterproof construction, good audio quality, and a decent battery life. 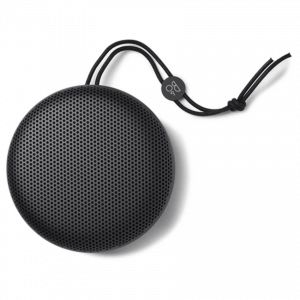 The P2 by Bang & Olufsen is yet another speaker for smartphones that sports a unique design. It’s at the top of our list for a number of different reasons. It presents itself with a plenty of bass despite its diminutive-looking design, and it even comes with a very easy-to-use app. Now that you’ve reached the end of our guide, you already know what to consider when choosing a smartphone speaker. There are many affordable options on the market, but once you find a speaker you love, and you’ll enjoy your music life better than before.